The Mia table is a stylish cast aluminium garden table which features detailed metalwork, including an expanding lattice design. Place this table in a sunny spot in your garden, or even on a balcony and enjoy soaking up the sun and casual outdoor dining. 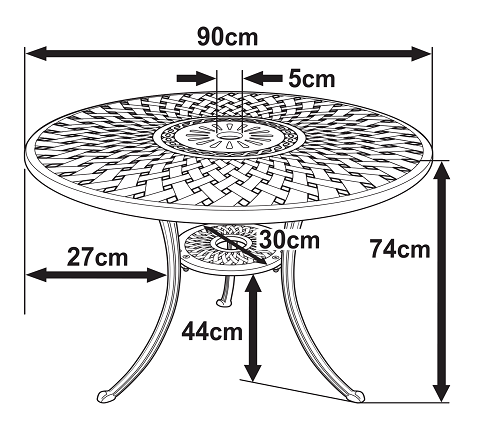 You can experiment with your bistro table’s location, because it weighs a mere 10kg making it easy to lift and move around. The Mia table is a popular choice with Lazy Susan customers. Free delivery is all part of the package at Lazy Susan, and we endeavour to make sure that delivery comes at no extra cost to the customer as we cover that for you, so you can proceed to checkout safe in the knowledge that no extra charges will be applied. Excellent quality table.arrived much faster than I expected even though I ordered it over a bank holiday.would highly recommend this product and the service of the company was excellent. Fantastic service. 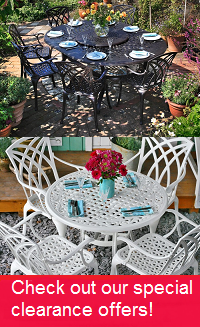 The item purchased - a garden table - arrived in under 24 hours. Brilliant! Lazy Susan was the only website where I found just what I wanted (a smallish, round, aluminium table). The table arrived quickly and was very well wrapped. Having all the bolts/nuts and spanners wrapped to a card was a great idea, and nothing could get lost. Instructions were pretty easy to understand. I'd certainly use Lazy Susan again. Fast delivery and GREAT table!! !